David Murphy is the weekday meteorologist for Action News Mornings (4:30am-7am) and Action News at Noon. David has earned Seals of Approval from both the American Meteorological Society and the National Weather Association, and also holds a Certificate in Broadcast Meteorology from Mississippi State University, following four years of study in the atmospheric sciences and geosciences. David talks about growing up and living in the Delaware Valley and why it is special to him. David came to WPVI-TV in 1990, as a general assignment reporter. 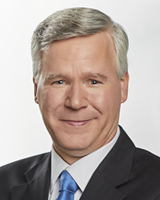 Prior to joining Action News, David was a reporter with WJZ-TV, Baltimore, Maryland, WMAR-TV, Baltimore, Maryland, WNEP-TV Wilkes-Barre/Scranton, Pennsylvania, and with WFMZ-TV in Allentown, Pennsylvania. David was honored with several United Press International Awards for reporting while in Allentown, Pennsylvania. David is also a graduate of Temple University, Philadelphia, where he received a Bachelor of Arts degree in Communications. In 1984, he was the first Temple University student to win a national scholarship from the Radio-Television News Directors Association. David talks about how he got the opportunity to come home and work at Action News. As a weather reporter, David has covered hurricanes in North Carolina and Louisiana, as well as a major tornado outbreak in Oklahoma, and has produced Action News feature reports on numerous aspects of local Delaware Valley weather. Memorable news assignments include the Oklahoma City Federal Building bombing and the attacks against the World Trade Center in 1993 and 2001. Rapid fire Q & A with David. David and his wife, Barbara, have 3 children and reside in suburban Philadelphia. He enjoys traveling with his family. David is involved with several local charities including annual fundraising efforts for the Parkinson Council and the Delaware County Regional Cancer Center. David is also a long-time Phillies fan and can often be spotted with his children and friends at the ballpark. At Faithful Friends in Wilmington, Delaware Harvey the dog is now known as Harvey the hero. The Morris Animal Refuge is breaking out the big top for their biggest fundraiser of the year. Project Meow is a non-profit that cares for a large number of cat colonies in West Philadelphia. The Barking Lot is the newest feature at the Philly Home and Garden Show this year. 2018 was the best year ever for PAWS -- the city's largest rescue partner.